Comfort Services, Inc. can help evaluate your home's efficiency and indoor air quality to better provide an understanding to the sources and solutions for your specific home's needs. 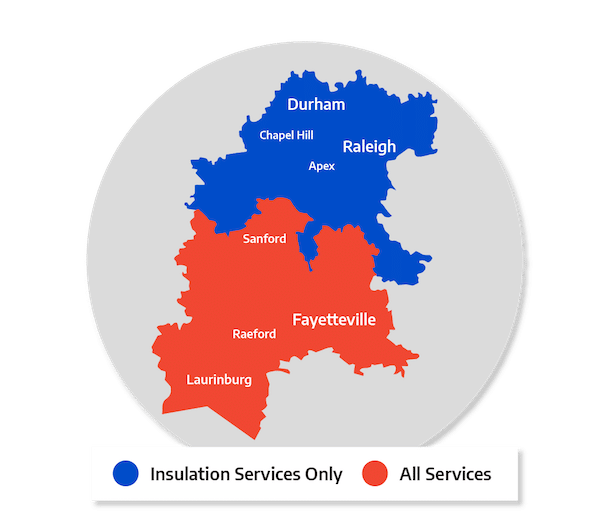 We offer our many services in Pinehurst, Southern Pines, Aberdeen, and neighboring areas such as Garner, Apex, Fayetteville, Chapel Hill, Fuquay Varina, Fort Bragg, Durham, and more. Also check out our home energy audit, which we use to diagnose your home's energy problems. Comfort Services, Inc. can help you identify sources of moisture and recommend ways to reduce and in some cases eliminate it all together. Common sources of moisture issues include high humidity; condensation on uninsulated pipes, ducts, and heating and cooling equipment; and water leaks in plumbing, foundations, roofs or anywhere else in the building envelope. Dehumidifiers, duct and pipe sealing and insulation, basement waterproofing and crawlspace encapsulation, and a thorough inspection of the home's HVAC, plumbing, roofing, siding, and flashing can help eliminate water leaks and reduce mold populations. We at Comfort Services, Inc. want to help your family enjoy your home and remain as healthy as possible. We believe in the benefits of proper insulation and other services and how they can improve your home's energy efficiency and health. Contact us today to schedule a home energy audit that we can use to pinpoint the sources of the discomfort and energy problems you're experiencing. Many times, energy deficiency and unhealthy homes are one in the same. We can fix both. We proudly service in and around: Pinehurst, Southern Pines, Aberdeen, Apex, Garner, Chapel Hill, Fayetteville, Durham, Fuquay Varina, Fort Bragg, and more areas throughout Central NC.